Developer Sarina DuPont from Embarcadero has a blog post up showcasing a new Windows 10 style for Delphi XE8. 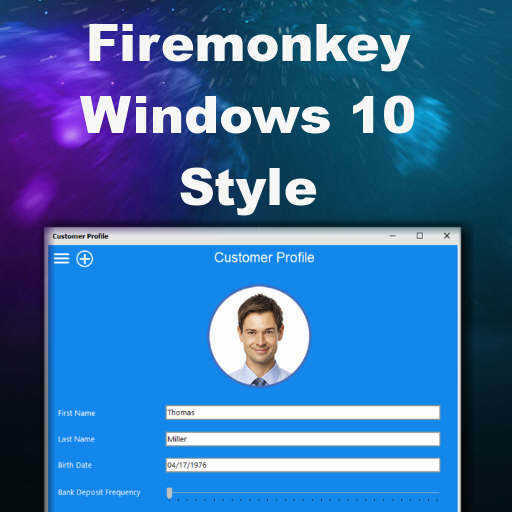 One of the great things about Firemonkey is it’s ability to deploy the platform style to each of the supported platforms (Android, IOS, OSX, and Windows) and this brings that support to the Windows 10 platform. On the other hand you can use premium styles to create a universal look for your app across all four platforms. The Windows 10 style is originally for VCL but if you load it up in the Bitmap Style Designer you can save it out to a Firemonkey style file. Once it is a Firemonkey style you can load it up into a TStyleBook or open it in the Firemonkey Style Designer if needed. The window chrome in Windows 10 is slightly different from previous versions so this gives you that window chrome in your Firemonkey apps in addition to the other UI changes. Having this style lets you get a head start on making sure that your Firemonkey app looks and works correctly on Windows 10. Marco Cantu also has a blog post up where he talks about Windows 10 support in Delphi XE8. You should also be able to use this style in Appmethod and C++Builder. 1. With the Master view selected, add a TStyleBook component to your form 2. On the Master view, select Windows as the Master style from the toolbar drop-down menu and then load the Windows 10 style to the StyleBook. When working with custom styles, each view must have a style, including the Master view. Set the StyleBook property on the Form to StyleBook1. 3. Switch to each of your created Windows views (i.e. Surface Pro and Windows Desktop) and select the TStyleBook component on that view and load the custom Windows 10 style to the StyleBook. 4. If your application consists of multiple forms, you can set TStyleBook.UseStyleManager = True in each view in order to use the same custom styles for all other forms at runtime. If TStyleBook.UseStyleManager = True is set, then custom styles fully override system styles in all other forms (Form2, Form3 etc.) that are part of your application for that particular platform. If TStyleBook.UseStyleManager = False is set, then new forms (Form2, Form3 etc.) will use the default platform style and for customization, you must add TStyleBook to Form2's "Master" view and load each custom style again for all created views of the additional forms that are part of your application. 2. On the Master view, select Windows as the Master style from the toolbar drop-down menu and then load the Windows 10 style to the StyleBook. When working with custom styles, each view must have a style, including the Master view. Set the StyleBook property on the Form to StyleBook1. 3. Switch to each of your created Windows views (i.e. Surface Pro and Windows Desktop) and select the TStyleBook component on that view and load the custom Windows 10 style to the StyleBook. 4. If your application consists of multiple forms, you can set TStyleBook.UseStyleManager = True in each view in order to use the same custom styles for all other forms at runtime. If TStyleBook.UseStyleManager = True is set, then custom styles fully override system styles in all other forms (Form2, Form3 etc.) that are part of your application for that particular platform. If TStyleBook.UseStyleManager = False is set, then new forms (Form2, Form3 etc.) will use the default platform style and for customization, you must add TStyleBook to Form2's "Master" view and load each custom style again for all created views of the additional forms that are part of your application. Update: Download the official Windows 10 style for Delphi XE8 Firemonkey from Embarcadero Code Central. Or download the free Windows 10 VCL style for Delphi XE8 from Embarcadero Code Central.